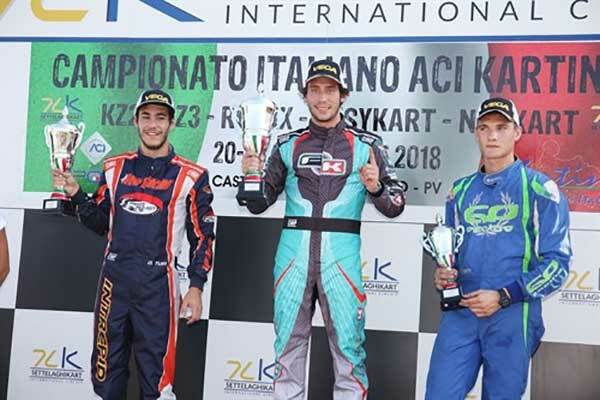 The Italian ACI Karting Championship ended on a high with the eighth round run at the Circuit 7 Laghi in Castelletto di Branduzzo (Pavia) that awarded the KZ2, KZ3 and Rotax Trophy titles after those given at the previous round in Ugento in 60 Mini, OK-Junior, Trofei Rok and Iame X30. The two protagonists of the KZ2 end of the season, 17 years old from Naples Giuseppe Palomba (Intrepid-TM) and Francesco Celenta (Praga-TM) from Salerno, former Italian Champion in 2016, saw Giacomo Pollini (Formula K-TM) from Brescia bouncing back. He won Race2 at the end of a very hard-fought final and installed himself on top of the standings clinching the Italian title after having led the charts in the initial part of the season. The quick Simone Cunati (CRG-TM) won the first final and was followed at the flag by Palomba, who secured a good margin in classification thanks to the second place, as Croatia’s Kristijan Habulin (TB Kart-TM) followed in third. In Race2 Palomba suffered the inverted grid and was handed a 10s time penalty for jumping the start and Christopher Hold (Maranello-TM) crossed the finish line on top but handed the victory to Pollini, who managed to recover in Race1 from P14 up to P4 before pushing hard in Race2 and taking the win. Francesco Celenta also run a great race. He climbed from P12 up to P5 and then was third on the podium, proceeded by Alessandro Buran (VRK-TM). What a pity for Palomba: the driver from Naples might have suffered a lack of experience compared to his rivals. The 20 years old driver from Marostica, Edoardo Tolfo (Formula K-TM), won the KZ3 Junior title thanks to the win claimed in Race1 ending in front of rivals Denis Tuia (Intrepid-TM) and Paolo Castegnetti (GP-TM). A lot of penalties in Race2 spoiled the final result but did not influence the title won by Tolfo. The race went to Castagnetti, who led Gian Marco Loddo (CRG-Tm), as the latter inherited P2 from Fabrizio Del Brutto (CRG-TM), who was in turn penalized for a contact. The third place went to Dennis Menegatti (VRK-TM) following a penalty handed to Mattia Giannini (Maranello-TM). Tolfo ended eighth but had already been crowned as the new Champion. In KZ3 Under, Marche’s Emanuele Simonetti (Tony Kart-TM) could celebrate the title after missing it by a whisker last year due to an ex-aequo that did not go in his favour. Simonetti won the title in Race1 despite a penalty that relegated him to P7. The title was then celebrated with the victory in Race2. Race1’s victory went to Filippo D’Attanasio (Formula K-TM) after the penalty given to Alessandro Cavina (Parolin-TM), Emanuele Simonetti and Riccardo Nalon (Formula K-TM). The second place went to Marco Pagani (Parolin-TM) and the third to Sirio Costantini (Intrepid-TM). Simonetti bounced back in Race2 taking a fair and square win leading Nalon and Cavina. 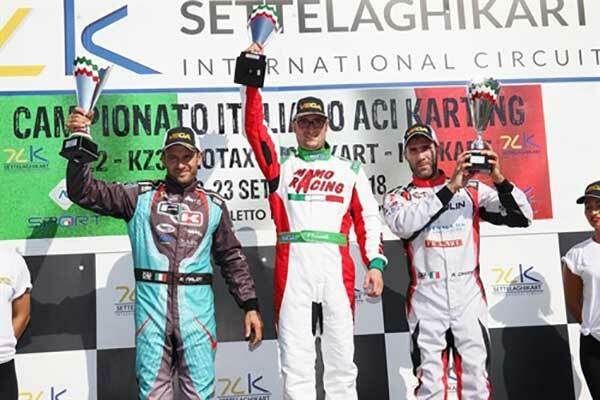 The first final of KZ3 Over was dominated by Cristian Griggio (Maranello-TM), while his closest rival, Claudio Tempesti (CRG-TM) was forced to the retirement due to a technical problem. The second place went to Sebastiano De Matteo (Intrepid-TM), who led Marco Ruschioni (Intrepid-TM). Andrea Spagni (Maranello-TM) managed to complete a good comeback in Race2 after an unlucky qualifying. Griggio was second behind his teammate and was crowned Italian Champion. 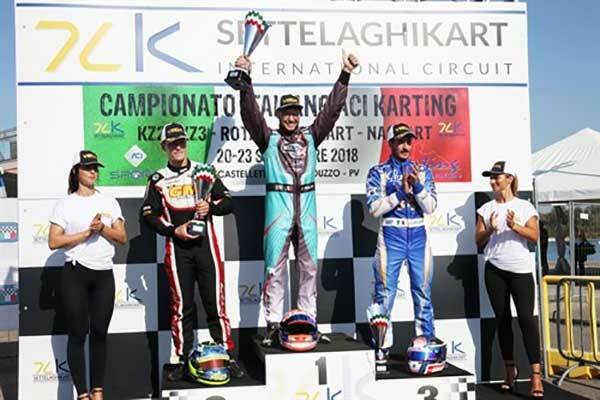 The third step of the podium went to Roberto Profico (Tony Kart-TM), who redeemed an unlucky season after being among the strongest of the category last year. In Rotax Max Davide Vuano (Praga) dominated also the round held in Castelletto and won the Italian title. Vuano won Race1 leading Patrick Marchetto (Praga) and Marta Bussola (Intrepid), he also repeated himself in Race2 winning this time from Bussola to Elia Galvanin (Exprit). The latter won both finals of Rotax Junior. Emma Segattini (Rotax Junior) won the Women title. In the Naskart trophy, Moreno Di Silvestre dominated both finals. He won the first proceeding Christian Castelli and Filippo Lazzaroni, while in the second he was joined on the podium by Alessandro Brigatti and Lazzaroni, who was third again.